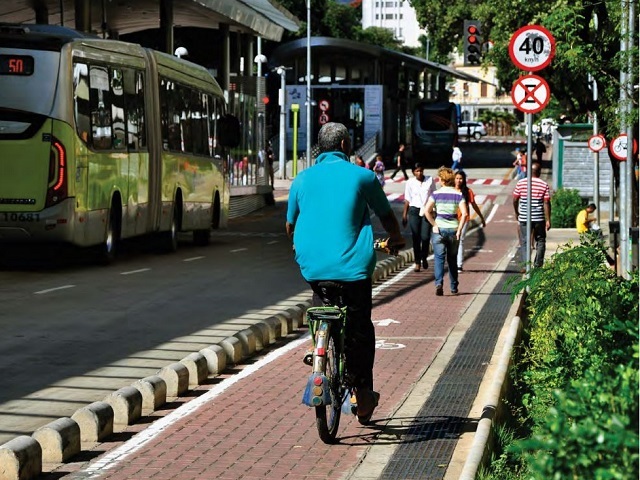 Investing in quality transport infrastructure–like bike lanes–can generate $17 trillion or more in savings for cities. Photo by Mariana Gil/EMBARQ Brasil. Climate-smart actions—such as investing in public transport and building efficiency—could generate $17 trillion dollars in net savings for cities by 2050 and cut annual greenhouse gas emissions by more than the annual emissions of Japan and Russia combined. Furthermore, with reforms to fossil fuel subsidies and additional support for low-carbon innovation, cities could save as much as $22 trillion. What is even more striking is that these estimates are conservative, as they do not take into account the huge investment costs that will be avoided with smart development. This is the key finding of a new report called Seizing the Global Opportunity: Partnerships for Better Growth and a Better Climate, which was released today by the Global Commission on the Economy and Climate—a group of leading figures across government, business, and finance. By making just those low-carbon investments which are economically attractive based on energy savings alone, leaders in the world’s cities could deliver 15-20 percent of the greenhouse gas emission reductions needed to put the world on a climate safe pathway. While the report shows that many cities worldwide are already demonstrating leadership, realizing the full potential of the low-carbon opportunities available in cities will require the help of global partnerships to go further and faster. Only about 20 percent of the world’s 150 largest cities have even the most basic analytics needed for low-carbon planning, and too few have created long-term plans and targets. This is a challenge to sustaining emissions reductions over time. Collaboration is the key to success. Research shows that cities taking a collaborative approach to governance deliver twice as many low-carbon actions as those who rely on direct implementation alone. Fortunately, cities are already coming together through organizations such as the C40 Cities Climate Leadership Group and Local Governments for Sustainability (ICLEI) to share knowledge, plug capacity and finance gaps, and scale up action. Similarly, with over 80 member cities, the Compact of Mayors is the largest cooperative effort among mayors and city officials to reduce greenhouse gas emissions and track progress. But more could be done. And this is especially important for cities in the developing world, which faces significant capacity, financing, and other barriers to scaling up action. National and sub-national governments and international organizations need to work together with cities to overcome the barriers to action and unlock the financing mechanisms necessary for smarter urban growth. Development agencies, city networks and organizations, and multilateral and regional development banks should help to accelerate and scale up efforts by developing an integrated package of US $1 billion or more over five years. A package of this size can support at least the world’s largest 500 cities develop and implement low-carbon development strategies by 2020 using the framework of the Compact of Mayors when possible. This could directly mobilize $5-10 billion of private sector funding, and leverage far more over time. National governments should support these efforts by empowering cities to invest and innovate. One way to do this is by developing national urbanization strategies with assigned budgets for smarter urban infrastructure. National Governments can create channels for cities with low-carbon strategies and accountable governance systems to engage directly with national development banks and international climate finance sources. According to the World Bank, only four percent of the largest 500 cities in developing nations are deemed creditworthy in global financial markets, primarily due to reliance on weak and narrow revenue bases. Total revenues of Indian local governments for instance amounted to less than 1 percent of GDP in 2007–08. This needs to change. The good news is that partnerships can work when done right and when international support is aligned behind locally owned and driven strategies. Lima, Peru, for example, recently secured a credit rating that allowed it to co-finance its Bus Rapid Transit system with loans from a domestic commercial bank, the World Bank, and Inter-American Development Bank. A group of C40 cities were recently able to come together to commit to procure 40,000 new clean buses by 2020 to drive down costs and help create economies of scale for a new technology. And emerging initiatives such as the World Bank-led Creditworthiness Partnership and the Cities Climate Finance Leadership Alliance are starting to help to accelerate additional capital flows to cities. These efforts need to be built upon and scaled up quickly. The recent work of New Climate Economy demonstrates that low carbon action can create significant economic, environmental, and quality of life benefits for the world, and in particular for our cities. The work of the Global Commission and cooperative city networks like C40, ICLEI, and UCLG are showing the way forward to a more prosperous, sustainable future. Let’s now work together and seize the $17 trillion opportunity for better growth and a better climate. Nick Godfrey is Head of Policy and Urban Development at the New Climate Economy, the flagship project of the Global Commission on the Economy and Climate. Nick is the lead author of the cities component of the New Climate Economy 2015 report.